I was doing some arranging at Primitiques this morning and tried this out. 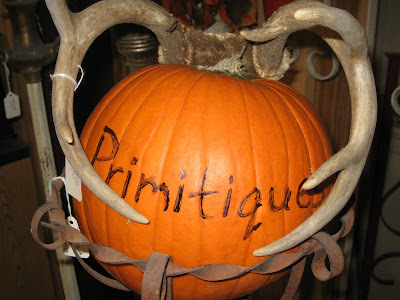 A deer pumpkin? As promised, here are some of my home decor choices for the Halloween season. Yup. A glass full of glass eyes. They came from an eye doctor's office, so yes, they are "real". Those teeth? Grandma Joy's. 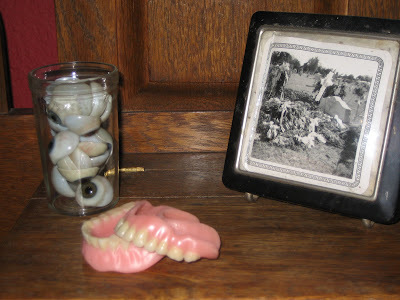 I have a jar full of her teeth displayed in my bathroom throughout the year. But, having them out in front of a framed picture of the grave of some kinfolk seems like a nice touch. 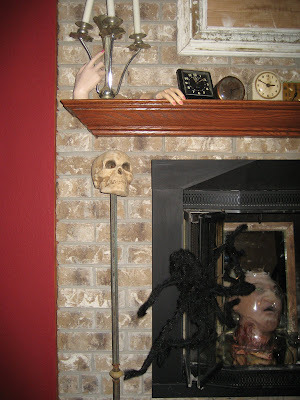 The skull, big spider and dead man's head in the fireplace are real screamers, yes? 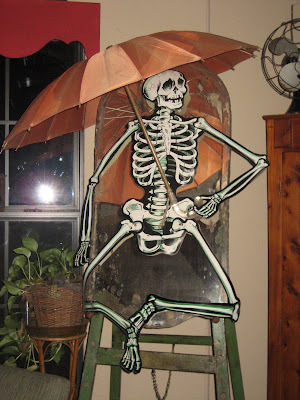 The paper skeleton holds onto an umbrella as he shows off my cool mirror. 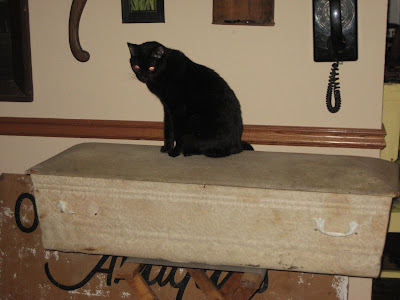 And Ellie Mae is sitting on top of the coffin. I bought this real live coffin at an antique store in Terrell years ago. It is one of my spookiest, prized possessions. The inside is lined in a silky type material, under which is straw. I like to think that this was a salesman's sample. What do you think? aaa...let me see. How can I say this nicely! I can't, so I'll just say it fast. See Kathie. 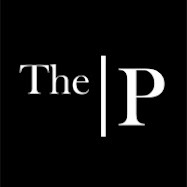 See Kathie's Stuff.